Once again, a member of the Haitian Chamber of Deputy with a problem of anger management. 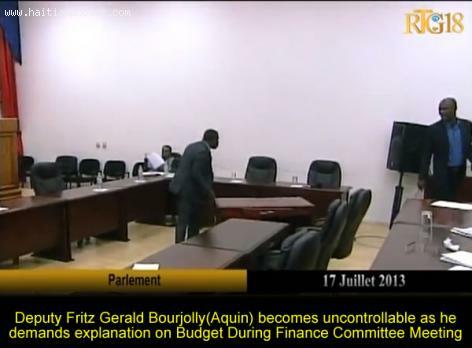 During a Finance Committee held by Deputy Rodon Bien-Aime, Deputy Fritz Gerald Bourjolly of Aquin got very upset to the point where he started throwing microphones, glasses, desks and anything he could find in the room to express his frustration. Here is the video footage of the scene. As you may recollect, this is not the first time the Chamber of Deputies was victimized following the frustration of its members. Haitian Deputy Arnel Belizaire recently exploded at the Haitian parliament, throwing a total of three desks across the room in a similar incident. Haitians are copying the bad behaviors seen on other civilizations without understand them. The curious thing is those special behaviors have some success in the public.